Can you confirm these amateur observations of Calotes liocephalus? Type locality: Peradeniya District, Ceylon. Reproduction oviparous. Ovipositioning at Peak Wilderness takes place during October –November (in 2010–2012). All the ovipositioning were observed during cool and shady weather conditions. This species lays 3–4 eggs at a time, and the eggs were 18.5–19 mm in length and 10.1–10.4 mm in width. The weight ranged between 1.4–1.8 g. The incubation period varies from 65–72 days (Amarasinghe et al. 2014). Diagnosis Diagnosis: Head without spines or rarely a rudimentary spine above the tympanum; dorsinuchal crest poorly developed; lateral scales directed backwards and downwards. Comment Illustration in BARTS & WILMS 2003. Synonymy partly after WERMUTH 196. 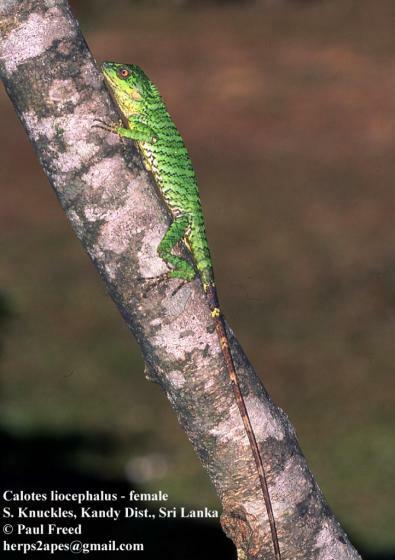 Rare and endangered in Sri Lanka (BAHIR & SURASINGHE 2005). Sympatry: C. liocephalus is sympatric with Ceratophora stoddartii and Calotes calotes, but allopatric with C. nigrilabris.